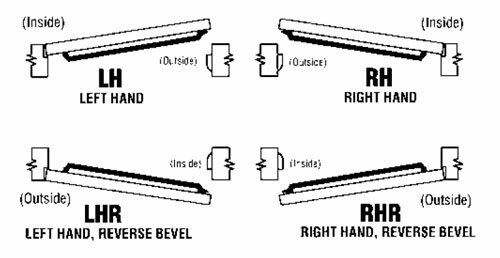 Reversible rim type touch bar exit devices feature deadlatching, and are non-handed (right or left opening), and easily installed. 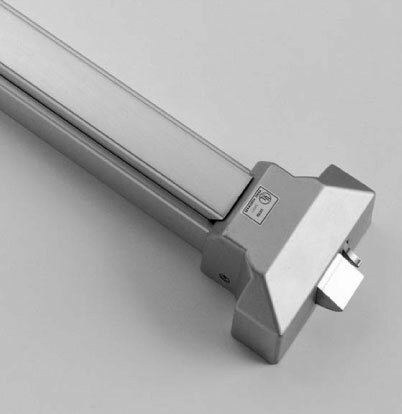 Hex key dogging is used, and the devices are available with exterior access accessories such as ball or lever keyed locks. Each unit is packed with a rim strike, shim and a complete kit of fasteners, including mounting templates and easy to follow instructions. The units are also Underwriter Laboratories listed and several are 1.5 hour fire rated. Hand of Door: The Hand of Doors, including double acting, is determined from the Outside or Lock Side of the door to which it is applied. If standing outside, the door Opens From you it is a Regular Bevel door, if Opening Toward you, it is a reverse bevel door.